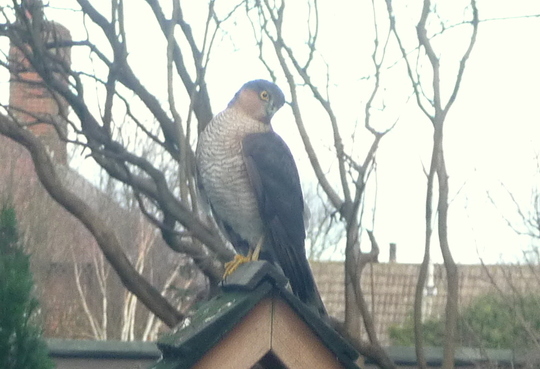 Sparrowhawk frustrated by moving bird table. Shame we can't rig a bell to ring when he/she lands on it, thus warning the little birds to stay away !!! Great Photo Jane/Ray :) This isnt what comes to My Garden & kills My Little Birds i know that 4 sure now by seeing this Pic? :( The 1 who hunts my garden has lighter coloured Wings the same colour as its Body & No Dark Head either ??? A handsome male - great photo BB. Beautiful bird, fantastic photo but I'm glad my little birds don't have to worry about one of these at the moment. ~ got to admit to feeling ambivalent about them BB~lovely but deadly!I want to protect my birds! My goodness! I've never seen one....what a proud and beautiful bird, Bb. Thank you for kind comments ..those eyes are something else arent they ? piercing yellow . So fast they often arrive early morning and dusk ..this chap been making dummy runs trying to gauge best line of flight. He swoops stalls and turns been trying for about a month to photo each morning seems to prefer overcast weather which this time of year makes it hard to get a decent shot. Yes Arlene not nice to see small birds picked off and certainly wouldnt want to post a pic of it .. can almost sense a strike as all birds scatter even rooks . Beautiful bird and well captured I just don't like what they do but I supose they have to eat no different to us. Oh my Ray, this is wonderful. It cant have been easy catching him. What a beautiful bird, they cant help their natural instinct albeit sad. Aye Wagger your Red Kites much kinder arent they ..
Hard to witness Morgana but sure not alone when sitting watching those fascinating wildlife programmes .. perhaps a lot better than us as they only catch things to eat not for sport etc.. Crafty arent they ... you did so well to get him, played him at his own game. Thats the closest Ive seen one of these, I call them all Kestral!! I wouldnt know the difference as they move so quickly dont they! you really did well getting that shot its very professional. You ll have seen Kestrels hovering along fields and motorway verges Maggy and quite a bit smaller than these . They only take mice and voles .. sparrowhawks will tackle doves pigeons and anything in between. Wow - thats an amazing picture - I only ever see raptors hovering over the fields when I'm driving in the car, never seen one in my garden and if I did I certainly wouldnt be able to get a pic like that! Thank you for lovley comments. Arlene as far as aware sparrowhawks hunt mostly at dawn and dusk,but the fella in our pic was sitiing there bold as brass at 9am ! All the birds had seen him coming and skiddaddled ! What a magnicent looking hawk ! I love his piercing, all-seeing eyes. Do you have many different types of hawks in England / UK ? Spot on with this photograph, I know just how hard it is to get a picture of the Sparrowhawk, they don't hang arounds, just swish in around the feeders and away, only very rarely do they land and you have to be there ready with the camera at the same time. I recon every picture of this bird is a lucky shot. I will post my one and only picture of this bird later on in my blog. Thanks again. I love it. Lovely photo, what a treat to see that in your garden! Flower,yes we have a wide variety of raptors from eagles to very small falcons. Lucky, lucky you never seen a still one, a brilliant photo BB. He is a beauty..too bad about your blackbird and him scaring the others off..is there nothing that frightens him off to the woods? I understand his need for feeding..but the feeder makes such a large target for him...I have eagles here and red tail hawks etc...most often they are going after ducks from the marshes below and small rodents that live on the bluff...I rarely see them bothering with the little birds at my feeders, I tuck them into the branches of a pine here outside my window to give them camoflauge as well ..but .the opposite is actually true as the little sparrows chase them both, eagles and hawks, valiantly pestering them away from their nests and territories.. These hawks live in woodland Cat and really the most expert fliers will dive between trees and branches and even pluck small birds off a pond. They operate by stealth and surprise so you never really quite sure when they will strike . I imagine eagles and other hawks would circle above when being mobbed by other birds .. this fella a real assassin flies in low over hedges and through trees . I ve moved the feeder closer to the house which is probably why I got the pic at least most can see him coming.There are feeders you can buy to protect smaller birds but these would nt protect the blackbirds or doves. Jane frightens him off to the woods but cant always guarantee being here .. Terrific photo BB. He's a beauty, not seen one here for a while now. I am sure you both do all you can to protect the smaller birds...you have a sideline seat watching nature in all its glory in these birds and their predator...it is the survival of the fittest in the natural world..everything does its job..thank you for working at letting us see what you see..I watched loads of birds at my feeder this morning from my window which has a screen on it so is no good for pictures..a Blue Jay came along and scattered all of them..they were certainly being little fluffers this morning in our freezing temps. Thanks PG ..getting a little too frequent visiting..
Have seen pics and film of your area Cat you really have nature at its wildest wolves bears mountain lions eagles and killer whales off your coast. I d be in wildlife heaven but acknowledge that these beautiful creatures are pretty lethal when it comes to feeding. Not sure Jane would cope too well trying to protect everything .. It is no good trying in this environment. David and I took and early morning walk into town one morning, walking into breakfast actually. Why I thought the eagles should not want breakfast as well.... I spent a good portion of the walk on the same trail I have been showing in my blogs, screaming at a mama duck and her babies to get down as an eagle was diving at the babies..it was terrible and nothing I could do especially when the second eagle came in to help..they got all the babies and not sure what happened to the mother...but if she survived she learned to not take her babies out into open water like that.. I hope..she must have been a new mom..as most often they will keep their babies in the reeds of the marsh close by..but she made a mistake or a wrong turn or something. Yes Cat sure not alone watching killer whales with amazement and fascination beautiful creatures that then feed on seals ..who can not be moved watching eagles . Only saving grace seems to be that animals that predated on breed in large numbers due to this .Often able to have further young if lose their first batch .. even their own breed will kill young to bring female back into season so guess our problem seems to be putting our human values onto nature. The biggest threat to them all is mankind. This is true...Ray..I worked on dive boats and saw many Orcas...in the waters north of here especially..such striking creatures...they pass through our waters regularly...most of the time they are following the salmon in the tidal currents...I have never seen them take a seal here, although they show that on tv a lot..good entertainment value I suppose they think. I have seen seals and sealions slapping the dickens out of salmon and biting the bellies out for their eggs and leaving them just that way...at least the Orcas eat the whole thing..and mind you, animals in the wild do not kill to be killing they kill to eat what they need and only when it is time for them to eat. They never take more than they need and are not greedy. Couldnt agree more Cat ....Aleyna..many thanks. have had similar experience with a sharp shinned hawk this summer...it went into the cedar hedge at about 30 mph (I think) and made off with a poor little sparrow who was hiding in the hedge... It gave me a sick feeling... I know it's natural predation but I hate to have the hawks acting like I'm complicit! I feed and house those little birds and enjoy feeling beneficent...I kept watch because the hawk would take one of my baby rabbits too if it had the chance. Bless you Jane...be ever vigilant. Wonderful shot. We get sparrowhawks around here. In the Summer there were two of them fighting in the road. Great shot. Love the attitude. Certainly has plenty of that Toto.